Can Rabbits Eat Cherry Tree Branches? Rabbits are well known for loving fruit tree branches because of their love for chewing them. They love the taste and they help to wear down their teeth. So what about trees such as the cherry tree. Can rabbits eat cherry tree branches? Rabbits cant eat any tree branches from fruit with stones in them. This includes fruit branches from fruit such as peaches, plums and apricots. They cant even eat their leaves, let alone their fruit because they are bad for them. 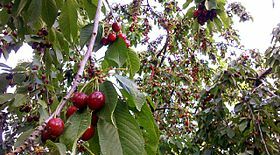 So steer clear of feeding them cherry tree branches, and if their hutch is close to a cherry tree, then it would be a good idea to move it to another location.